"A major film is being made in Seattle, but you'll probably never see it. It's a 10-hour movie that will be shown only in Japan." That's how a KING 5 news story of April 24 began. The reporter interviewed Densho executive director Tom Ikeda about a Japanese production crew filming scenes in Seattle before moving on to Eastern Washington. Filming is also taking place in Japan and Idaho. The final product won't in fact be a 10-hour movie, but rather a 5-part mini-series called "Japanese Americans" to be broadcast on Japanese TV. The producers consulted with Densho about the script, which focuses on multiple generations of a Japanese American family that settles in Seattle and is incarcerated at Manzanar, California, during World War II. The mini-series will air in fall 2010, and Densho will launch a companion Japanese-language website with historical references, thanks to funding from the United States-Japan Foundation. 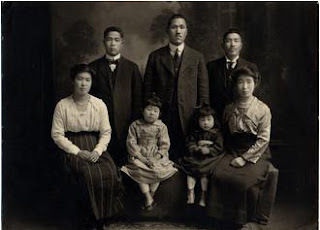 We've been told that 10 to 20 million Japanese viewers will see the mini-series, something that pleases Tom Ikeda, who says, "It's a clear signal that the Japanese are becoming more interested in Japanese Americans." Densho looks forward to more international communication and collaboration.